After a busy Sunday at home and Monday at work, it was a relief to get to home time on Monday evening, knowing that I wasn’t working again (at the hospital) until next Monday. Bliss! Billy had been due home sometime that afternoon so I was looking forward to seeing him, and when I got home, he offered me a cup of tea – which is very unusual for him. We went into the living room, and there was Raji! “Hello” I said, surprised. “Hello” he said, “Didn’t you expect me?” Erm, no, I hadn’t expected him. Billy had said a few weeks ago that Raji was going to see what the timings of their trip were, and what time he could get off work, and consider coming back with Billy to stay until the next weekend’s plans. Nothing more had been said, so it was a complete surprise to find that Raji had come. Luckily, we keep our spare room ready to use, so all I had to do was make up the bed. Unfortunately, there is no food in the house until I go shopping on Thursday, and I have plans for the week, but Raji is perfectly happy to just fit in and relax. We had a Chinese takeaway that night, whilst watching Premier League All Stars football, (City through to the quarter finals YAY!) though both men were falling asleep, and Raji was the first to give in, and Billy and I weren’t much later. Laura’s snails have laid eggs. At least, Deidera has, and there are about 100 little white eggs which Laura has removed from the tank. She has kept 10 to hatch as she has some friends that want some, and the rest she has destroyed. It is illegal to allow any Giant African Land Snails to be released into the wild as they are voracious, so eggs must be frozen (or baked) then crushed, before throwing away. She had hoped that the reptile shop might want some but they didn’t, and they have no turtles which eat the eggs, only creatures that would eat the newly hatched babies. Naturally, Laura doesn’t like the idea of hatching babies just to be eaten, so she’s gone for freezing and crushing most of these. She sad it’s very hard work crushing them too! She also thinks there are more eggs to come so I she’ll have more crushing to do. My Nan – is still hanging on in there, but I think she’s getting weaker. After I complained to the hospital in Sussex, the matron investigated and responded. She organised a full refund of the taxi rafe that mum had had to pay, and has told the taxi firm that they were int he wrong regarding that, and the not taking the wheelchair. She also explained why Nanny was discharged, and though the family don’t agree with it still, we do accept they did as they thought was right. We have, however, continued to object to the lack of information given and asked that those responsible, be quietly told that it is unacceptable. A discussion with Nanny’s GP means we all feel happier that he is thinking the same as us and that he really is doing his best, so we are satisfied that he knows how we feel and we know what he’s trying to do. I have a new practitioner at my clinic this week and I’ve added a page for him on my professional site. My wonderful hosts, DivisionX completed the migration of my sites to their upgraded servers without a hitch. AND when I didn’t reply to one of their mails (because I was away from the computer) they phoned me the next day to see if I was OK. You can see why I like them! They treat me as a person not a number, and they even put up with my idiotic questions and pleas for help. Toby is losing weight and we can feel his spine now, but the sickness has calmed down a lot since we’ve added slippery elm bark powder to his food. It seems to help soothe his tummy. In all other respects he seems happy and normal, so we carry on just watching him. 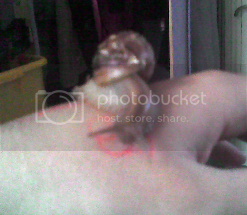 One of Laura’s snails (Deidara) is “pregnant” – will soon lay eggs and Laura seems to think they will be fertilised as the node on the snail’s neck was white indicating fertilisation has taken place. Her friend wants two snails if any make it to young snailhood, and I think she’s going to ask the reptile shop if they want any extras that survive. THANK YOU to all of those who have sent me messages of sympathy. It was very much appreciated even though I didn’t repy to you – hopefully I will rectify that soon. On Friday, I went into the hospital to see Lee and she is happy to cover me for the day of the funeral. Billy has also managed to get just the one day off work, so we will go to London for the occasion, and back in the same day. I had taken Billy breakfast in bed as a way of offering him my moral support, and after leaving Lee, it was Billy’s lunchtime, so I met him and we had a picnic in the park. 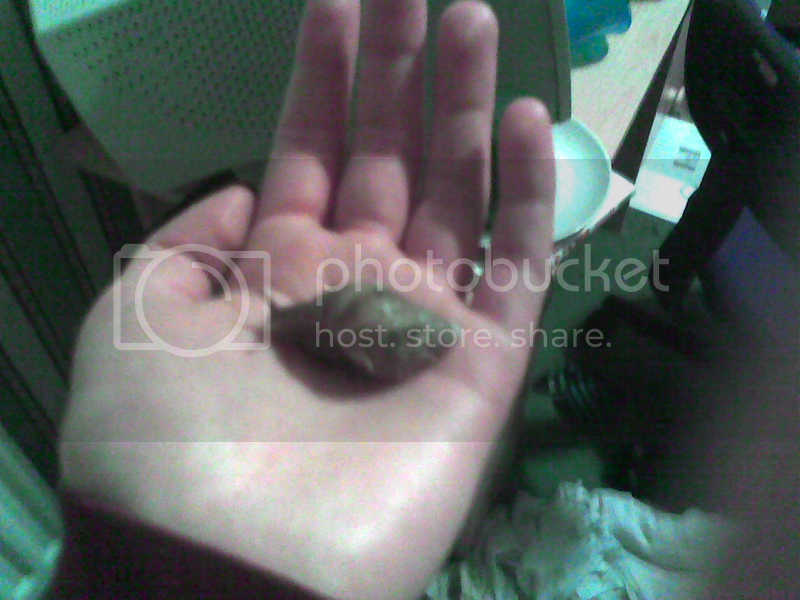 I really can’t do anything practical so this is my way of letting him know I am there for him. Over the weekend, I have been very busy painting the hallway. Since it had been re-plastered, I had to do an undercoat of thin white paint, then the two coats of coloured paint, then the wood boarding and the front door. I also took apart the lights and cleaned them and they came up brilliantly shiny. I ran out of time (and energy) to do the gloss work, but I still think it looks amazingly different. Sol has said he will help me to put up our signed football shirts on the walls sometime this week, which hopefully finish the transformation (barring afore mentioned gloss work, and the desperately needed new carpet) He was here all day Saturday re-plastering the bathroom ceiling so we kept each other going throughout the day’s work. I must admit, I could have done without the interruptions of washing up, clearing up cat sick, and putting washing out – then getting Billy’s cricket gear back in as it was raining and he needed the stuff for lunchtime.. I did get to relax on Saturday night. Stephen and I watched “The Matrix” which I had seen many years ago, and Stephen wanted to watch. First he suddenly had the urge to make some scones – and had me in stitches at times – especially the bit where he rolled out the dough and cut it – into biscuit thin circles, and had to pile them up on top of each other to get the right thickness. 😀 (I was recently asked who makes me laugh the most – and my answer was Stephen. ) They tasted good though, and we ate them with cream and jam whilst watching the film. We’re going to watch the next two Matrix films together too. He has now finished his GCSE’s by the way, and we think we’ve found the solution to his A Level options. We think if he swaps his Language Language to English Literature, he can still do both ICT and Media Studies, and Business studies. Fingers crossed. So – whilst all our bad news is still there, we are doing our best to keep going with other things and hopefully everything will settle down onto a more even keel. After lunch, Laura and I went to the reptile shop and collected the new tank for her snails, and a lovely piece of dark (sterilised) drift wood on which they can climb, and a ceramic water dish which is heavy weight and shallow so they can safely bathe in it. We then went and got a bag of organic compost from the garden centre and when we got home, Laura moved the snails into their new penthouse suite! They LOVED it! They particularly seemed to like their log and spent hours studying it. I swear they are growing every day now, and they are huge. Monday and Tuesday were routine days at the hospital, but as Billy and I haven’t had much quality time together lately, we decided to go to the cinema and for a meal on Tuesday evening. Unfortunately the films and times of films weren’t much good to us, so instead, we decided to hire a DVD and have an Indian takeaway. We went to the DVD shop together and chose “Soldier of God” as it looked quite good, and we settled to watch it after eating our curry (we were both like beached whales, having eaten too much!) This film was the weirdest film I’ve seen, I think. We couldn’t make head nor tail of the point of it. It had no beginning, middle and end – instead, it was all “middle”. We had no idea WHY things happened as they did (and we’ve both got an idea of the historical events of the time), and all in all, it was very unsatisfying. We kept going round in circles discussing it, for the rest of the evening, and even after we’d gone to bed. Anyway, we then sat and watched the second half of the Liverpool v Chelsea Champions League match. WHAT a game! I really wanted Liverpool to win it, and though Billy doesn’t like either team, he reluctantly conceded that Liverpool deserved it more for the way they were playing. By the time it went to penalties (which we felt was what Chelsea had played for) I was convinced Chelsea would get a jammy win. It was fantastic when Liverpool did it – and so convincingly too. Well done Liverpool! They deserved it on the night, they deserved it because of all Mourinho’s snide remarks leading up to it, and it’s good to have someone ELSE, besides the two usual suspects, up for a cup. I would like to see Liverpool take the Champs League title, and one of Chelsea or Man Utd take the FA Cup and the other take the league title – why should any one team have it all their own way? Though, as I’ve said before, as a football purist, I acknowledge that Utd do play some superb football (which Chelsea most assuredly do NOT) and therefore are more worthy winners of the title in my opinion. 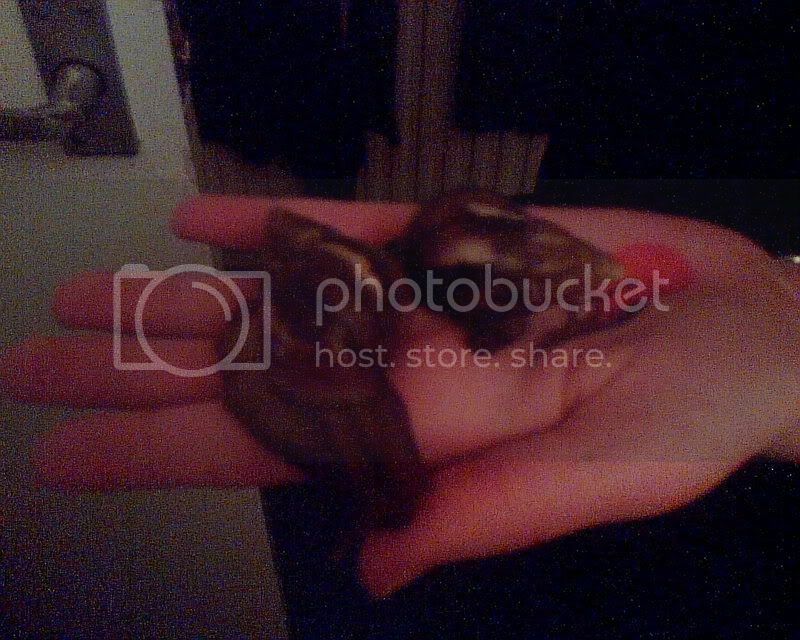 I forgot to mention that on Sunday, I called into the reptile shop to see if I could get a larger tank for Laura’s Giant African land Snails, Deidara and Sasori. They have been growing fast and need a much bigger tank now. The man was very helpful and I’ve ordered a nice big one, and a new log over which they can climb. 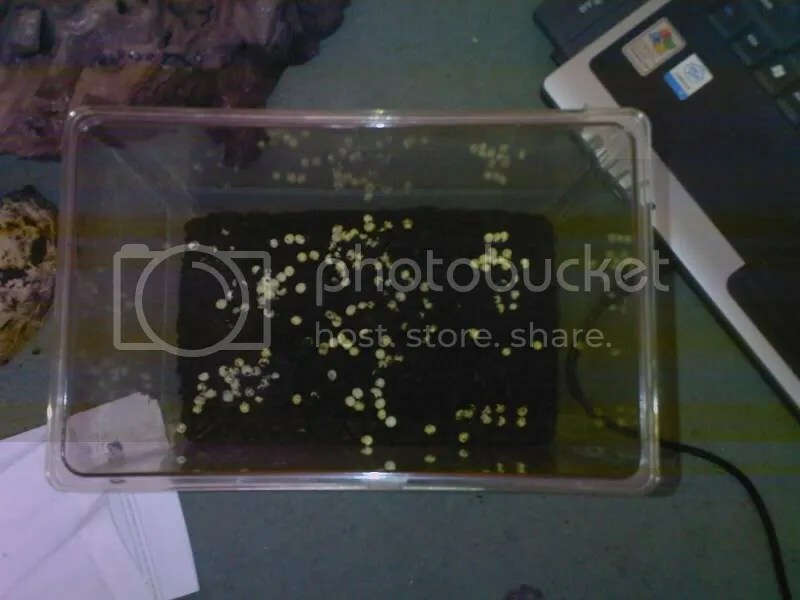 I’ve also established that they sell the substrate the snails need and that if Laura manages to miss any eggs that are laid, they can take them off our hands to feed to the reptiles. They had some gorgeous snakes in there – though I wasn’t so keen on the frogs and toads. I thought I stayed admirably calm when he removed the lid of a tank housing a toad, so he could show me the bark chips inside. I was very pleased when the lid went back on as I’m sure that toad was looking at me just waiting to jump up into my face 😉 Happily, I managed to avoid looking at the stick insects and other 6-legged-beasties. Shudder! I’ve also put Laura’s name down for work experience there next year – they get a huge demand apparently as they are one of few reptile specialist retailers. Lee phoned me Sunday evening as a family emergency had occurred, and she wanted to ask if I could work on Thursday for her, and she’d do Tuesday, and I agreed. So I worked on Monday as usual, but then had Tuesday off – very weird! I therefore did the shopping two days early, and I’m not entirely sure how well I’ve done. It was very hard to think properly, as we still had cupboards half full! I was also trying to think what we’d want over the weekend, as mum is coming to stay – hope I got what we needed. I’m looking forward to her stay anyway as it’s been a while since she visited. The main reason is so that we can be together for St George’s Day (the day we share in dad’s memory), but she will also have the chance to see Billy, the children, the cats, our new shower-room and my new clinic.